One of Houston’s best gated communities, Ravenna is an exclusive Spring Branch neighborhood with homes and community facilities that exude an upscale Italian town vibe. With elegant homes and community facilities reminiscent of early 1900 Italian towns, Ravenna is an upscale neighborhood within Spring Branch. 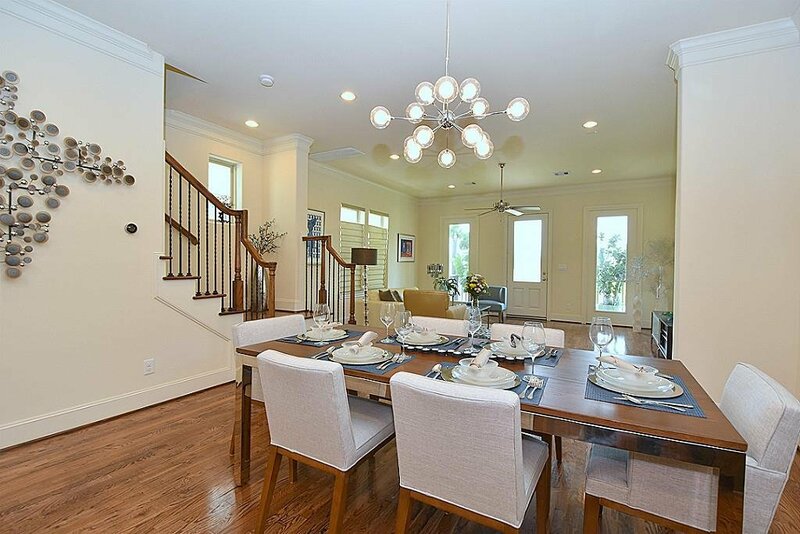 This charming new residential neighborhood is one of Houston’s best gated communities. It is conveniently located just outside Loop 610, blocks away from I-10. HIGHLY RATED SCHOOLS: Ravenna is zoned to the acclaimed Spring Branch ISD. Students attend Spring Branch Middle School and Memorial High School, public schools ranked among the best schools in Texas, according to the Houston’s Best Schools report. CONVENIENT ACCESS: The neighborhood is close to Houston’s key thoroughfares including Katy Freeway, Loop 610, and Highway 290. This provides residents easy commutes to Energy Corridor, Downtown Houston, Memorial City, and The Galleria. RESORT-LIKE AMENITIES: Ravenna has a resort-style Amenity Center that houses a pool and dog park. Pocket parks and beautiful landscaping immensely improve the quality of life in this vibrant subdivision. SECURITY: The neighborhood is protected by a 24-hour manned security gate. EXCITING OUTDOOR ACTIVITIES: Ravenna has great access to parks, golf courses, and hike and bike trails in the city. 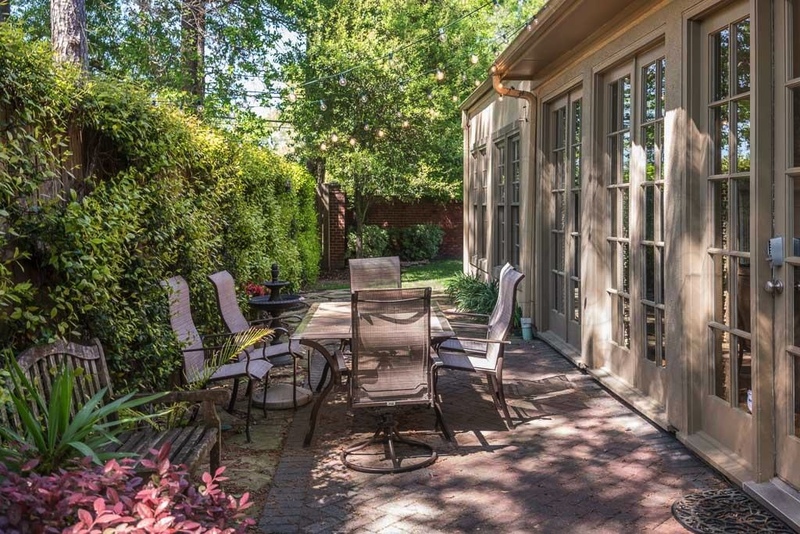 It offers quick access to Memorial Park, River Oaks Country Club, and the Buffalo Bayou. BEAUTIFUL HOMES: Ravenna homes feature Mediterranean aesthetics with high-quality modern fixtures and custom finishes. Kitchens are fitted with stainless steel appliances, and the living areas have hardwood floors. Ravenna is a new construction community within Spring Branch, one of the larger neighborhoods in Houston; these make its real estate market tricky to navigate. 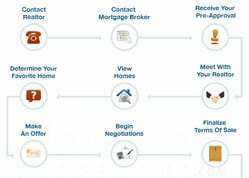 Consulting with the best Houston Realtor for suggestions and advice can greatly benefit homebuyers. Enter your email to get this free Gated Communities Guide in easy-to-read PDF format. 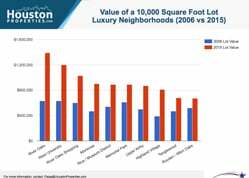 Bonus: Also see how Ravenna compares with nearby luxury gated communities. I am interested in Ravenna and would like to get more details. A charming new construction gated community within Houston’s Spring Branch neighborhood, Ravenna is named for an Italian city known for its colorful mosaics. Ravenna is zoned to the acclaimed Spring Branch ISD. Students attend Spring Branch Middle School and Memorial High School, public schools ranked among the best schools in Texas, according to the Houston’s Best Schools report. The neighborhood is close to Houston’s key thoroughfares including Katy Freeway, Loop 610, and Highway 290. This provides residents easy commute to Energy Corridor, Downtown Houston, Memorial City, and The Galleria. Ravenna has a resort-style Amenity Center that houses a pool and dog park. Pocket parks and beautiful landscaping immensely improve the quality of life in this vibrant subdivision. The neighborhood is protected by a 24-hour manned security gate. Ravenna has great access to parks, golf courses, and hike and bike trails in the city. 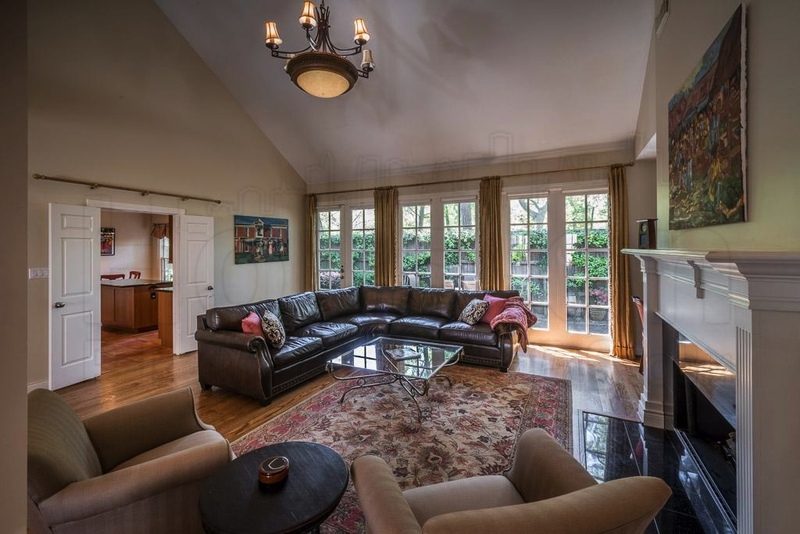 It offers quick access to Memorial Park, River Oaks Country Club, and the Buffalo Bayou. Ravenna homes feature Mediterranean aesthetics with high-quality modern fixtures and custom finishes. Kitchens are fitted with stainless steel appliances, and the living areas have hardwood floors. A new luxury development from Lovett Homes, Ravenna broke ground in 2012. 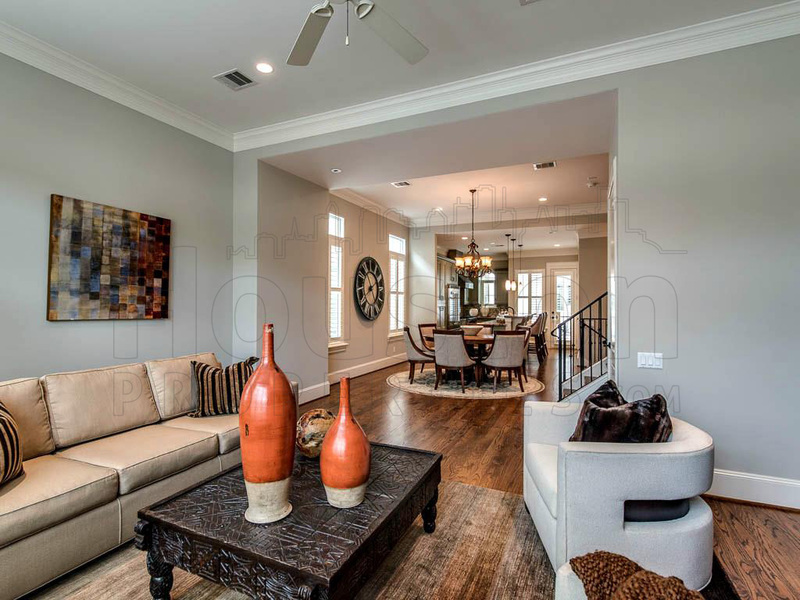 Lovett Homes’ Houston portfolio also includes other upscale communities like Southside Circle and Tanglewood Hollow. 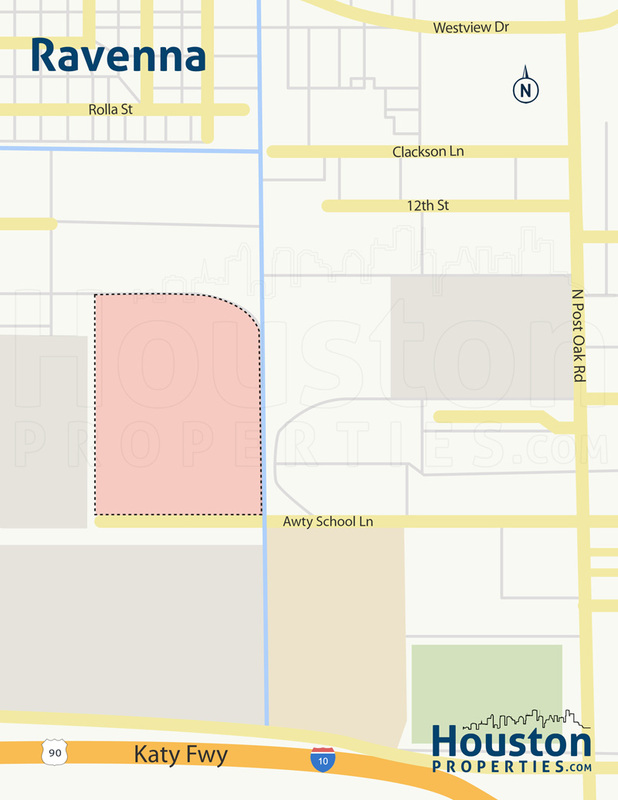 The community is located near a cluster of commercial establishments along I-10. Marq’E, Walmart, and IKEA, along with many restaurants and stores, are minutes away from Ravenna. Ravenna homes borrow inspiration from Mediterranean influences and feature white stucco and brick exteriors, tile roofs, arched doorways, iron banisters, and private balconies and courtyards. The community is a short walk away from The Awty International School, a private school known for its International Baccalaureate Diploma Programme (French A.B.). The most expensive Ravenna homes can feature elevators, 3-car garages, rooftop terraces, Miele custom appliances, custom cabinetry, and large walk-in closets. Prices for Ravenna homes for sale can range from $700,000 to over $1,500,000. Covering an 8 and half acre area just outside Loop 610, Ravenna is a new construction fully gated community with a 24-hour manned entrance. The gated community sits south of Westview Drive, east of Silber Road, west of Post Oak Road, and north of Interstate 10. Other main arteries within a few minutes of the community include US 290 (Northwest Freeway), Memorial Drive, Old Katy Road, and Washington Avenue. Thanks to its location, residents have great access to key Houston districts, including downtown Houston (8 miles), the Galleria (4 miles), Memorial Park (about 2 miles), Memorial City (7 miles), and the Energy Corridor (12 miles). Ravenna is near Awty International School, a short distance away from a cluster of commercial establishments along I-10 and Silber Road. Stores and entertainment hotspots nearby include IKEA, Walmart Supercenter, and Edwards Houston Marq’E. For more dining and retail options, residents can visit the Galleria/Uptown Park area, home to over 5,000,000 square feet of retail space. Several retail centers, including the Galleria and Uptown Park are located within the district. Residents are also a few minutes away from one of Houston’s largest urban parks, Memorial Park. The 1,400-acre park features a top-rated golf course, miles of trails, a picnic loop, and several sports facilities. Ravenna is zoned to schools from the highly regarded Spring Branch Independent School District (SBISD). Spring Branch ISD is known for its multi-award winning schools, most of which have been named National Blue Ribbon School. Headquartered in Ravenna, the SBISD received a “Met Standard” accountability rating from the Texas Education Agency in 2016. National Blue Ribbon Schools Spring Branch Middle School and Memorial High School serve Ravenna. Housman Elementary School at 6705 Housman. Housman Elementary, home of the Mustangs, has received a number of TEA Gold Performance awards and has been rated “Exemplary” multiple times. Spring Branch Middle School at 1000 Piney Point Rd. Spring Branch Middle School is located in Hedwig Village, and is one of Spring Branch ISD’s National Blue Ribbon awardees (1997-1998). The school offers a variety of electives including Foreign Language, Technology Education, Family and Consumer Science. Memorial High School at 935 Echo Ln. Also located in the city of Hedwig Village, Memorial High School is one of the most highly regarded schools in the area. It has received the TAKS Gold Performance Award and the College Readiness Award. It was also named a National Blue Ribbon School in 1988-1989. The following are some of the more notable private schools near Ravenna. 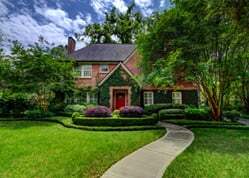 To find an updated listing of all Ravenna real estate zoned to any specific public school, please send an email to Paige Martin at Paige@HoustonProperties.com with the property preference and budget that you’re working with. Ravenna is a fairly new development, with homes built from 2012. 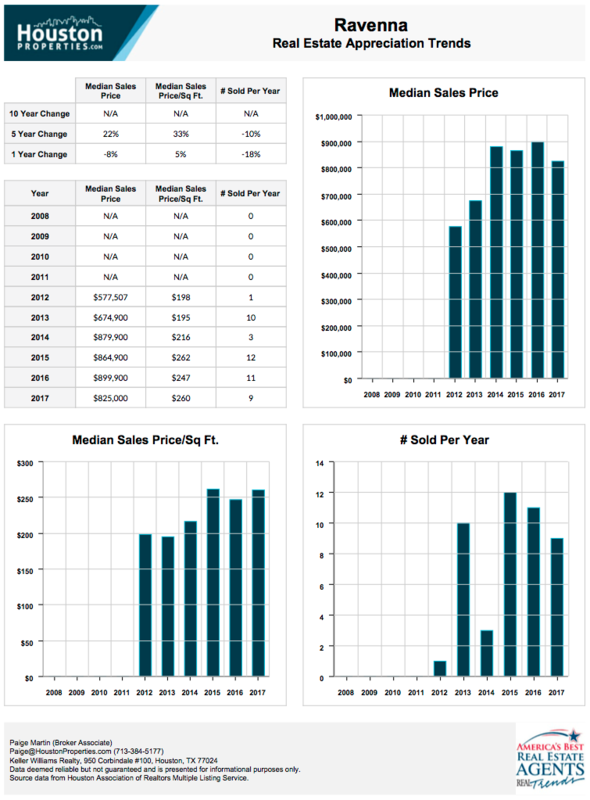 The community has posted positive changes over the last 5 years, with the median sales price peaking at just under $900,000. Made up of a mix of townhomes and detached single-family homes, the gated community is popular for its exemplary schools, great accessibility, and the lock and leave lifestyle it offers. 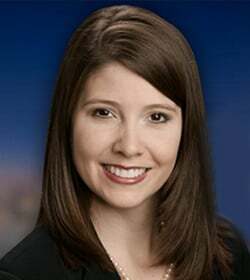 For updated information regarding Ravenna real estate pricing and trend analysis, please contact Paige Martin at Paige@HoustonProperties.com. Ravenna is made up of new construction homes built from 2012 to 2018. A development from Lovett Homes, the gated community features a variety of floor plans, designs, and styles. Drawing inspiration from Mediterranean architecture, Ravenna homes are quite distinct. White stucco and brick exteriors, tile roofs, arched doorways, iron banisters, and private balconies and courtyards are common features. Additional features include 3-car garages, elevators, rooftop terraces, Miele appliances, custom cabinetry, and large walk-in closets. Some Ravenna homes feature downstairs master suites, while others have first floor living area. Ravenna homes offer 3- to 5-bedroom floor plans spread over 3,000 to over 5,400 square feet of living space. Lot sizes are smaller, though homes in the area typically offer fenced-in yards. Prices for Ravenna homes for sale can range from $850,000 to more than $1,600,000. Ravenna townhomes are typically smaller, featuring 3-bedroom floor plans with 3 to 4 full and 1 half baths. Home sizes range from 2,500 to around 3,200 square feet. Designs and fixtures are mostly similar to their single-family home counterparts. Prices for Ravenna townhomes for sale can start at $675,000 and can get up to $800,000. There are no mid- or highrise condominiums within Ravenna. There are, however, some residential condos in nearby Memorial. The Galleria also offers a number of luxury condos. To see other condos within the Inner Loop, see Inner Loop Houston Condos. To see more condos within and near the Memorial area, please see Houston Galleria Condos. Named for an Italian town known for its colorful mosaics, Ravenna broke ground sometime in 2012, under Frank Liu’s Lovett Homes. Like the developer’s other projects in the Houston area (including Southside Circle), the gated community features a mix of upscale townhomes and detached single-family homes. The community’s master plan includes a central park area and resort-style pool. It is fully gated community with a 24-hour manned entrance. 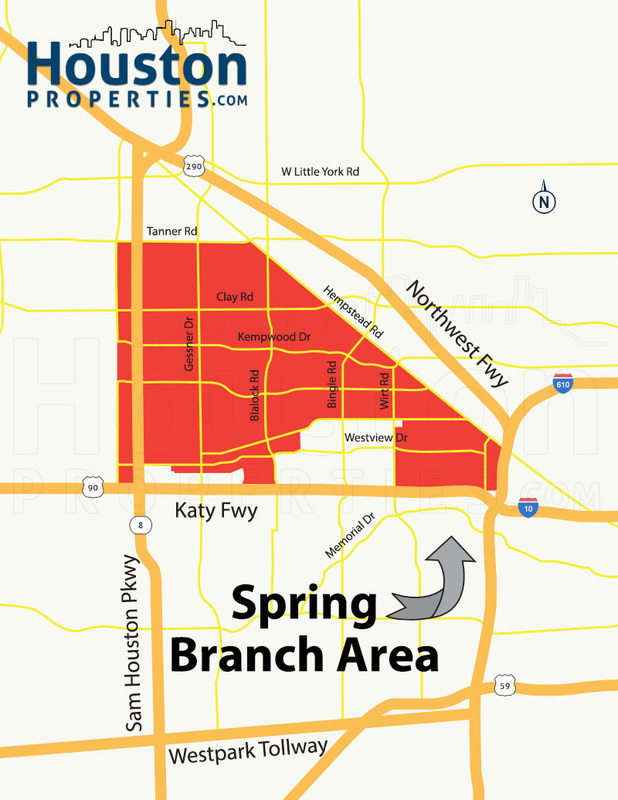 Most of the Spring Branch area used to be heavily wooded and was originally settled by German farmers. 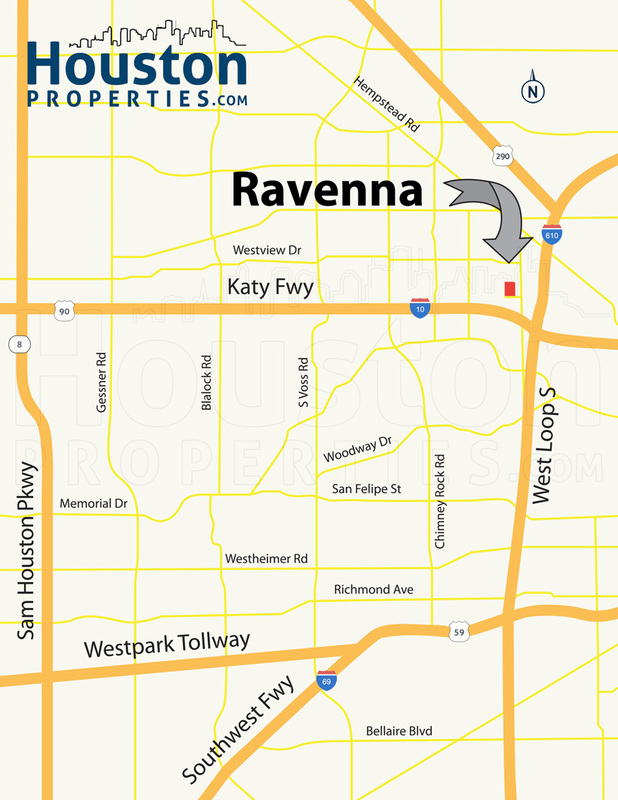 Located just a couple of blocks away from Interstate 10 and Loop 610, Ravenna is highly accessible to and from key entertainment and retail hotspots like the Galleria, Memorial City, and Memorial Park. The Galleria area, located less than 4 miles away from the gated community, features a number of retail centers, stores, boutiques, restaurants, and nightlife options. Uptown Park and the Galleria are popular destinations in the area. Memorial Park, one of Houston’s most popular outdoor entertainment hubs, is a short drive away from Ravenna homes. The Memorial Park Golf Course, the Seymour Lieberman Exertrail, the Houston Arboretum and Nature Center are all within the park. The 1,400-acre park also features several sports fields and facilities, a swim center, a tennis center, miles of trails of varying difficulties, and a picnic loop. Like most gated communities, Ravenna also showcases a few active lifestyle amenities, including a resort-style swimming pool, a dog park, and pocket parks and green spaces scattered throughout the community. Several options are also located just outside the community, particularly along the stretch of Interstate 10. Options include Walmart, Edwards Houston Marq’E, and IKEA, among others.